After that, add the rules you need on your firewall, to allow connection between Jenkins master and slaves using that port. 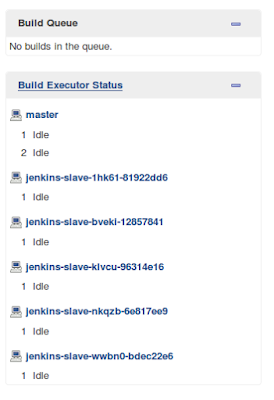 Jenkins Swarm plugin will use jenkins credentials, that needs to be passed to the slave, to connect to the master. So be sure to create some credentials for the Jenkins master domain, based on user/pass. You will need the https://wiki.jenkins-ci.org/display/JENKINS/Credentials+Plugin to achieve it. First item that we need, is a docker image that is capable to act as a Jenkins Swarm slave, and capable to run some tests on it. For this purpose, i've created a Docker image that is available at https://hub.docker.com/r/yrobla/jenkins-slave-swarm-infra/ *. This image is based on general Docker java images, using version 8. In top of that, we download the Jenkins Swarm client to be able to connect this node to the Jenkins master, and we also add some extra packages that are needed normally to peform python tests. * Please note that label is an optional parameter, very useful when you need to limit the jobs that run in this type of container. 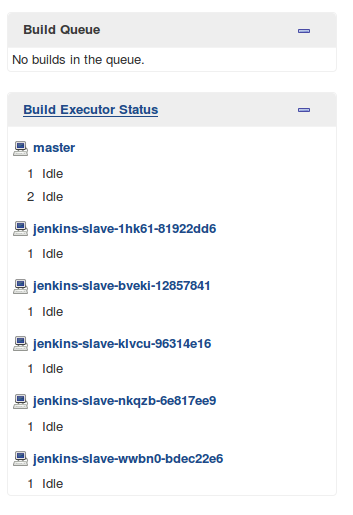 Once the replication controller has been created, you will see a new jenkins slave connected to your jenkins master. Using this technology gives you a very powerful and easy way to perform your tests or build your artifacts, with the only limit of the minions you are able to provide in your Kubernetes cluster.